This career is converted from The Sims 2, I didn't make this. The Deep Sea, something you always were interested in. From cutting fish, cleaning tanks, researching sea lice and a whole bunch more activities: you can’t get enough. There is only one thing you want to achieve: to keep the ocean clean and healthy for its inhabitants. When Sims, or sharks, desire something other than clean cut fish, that's when the Fish Chummer steps in. Clean it? Cut it? Why bother when squeezing and smashing will just as easily do the job? It's been suggested that Dolphins are the most intelligent species on the planet. So rightly so, they need people to clean up after them. Thoughts of calculus, wave form particle physics, and balancing balls on one's nose, leave little time to tidy up a tank. You've got the mechanical skills, they don't, so use 'em. You're finally out of the dolphin tank and into the fire. 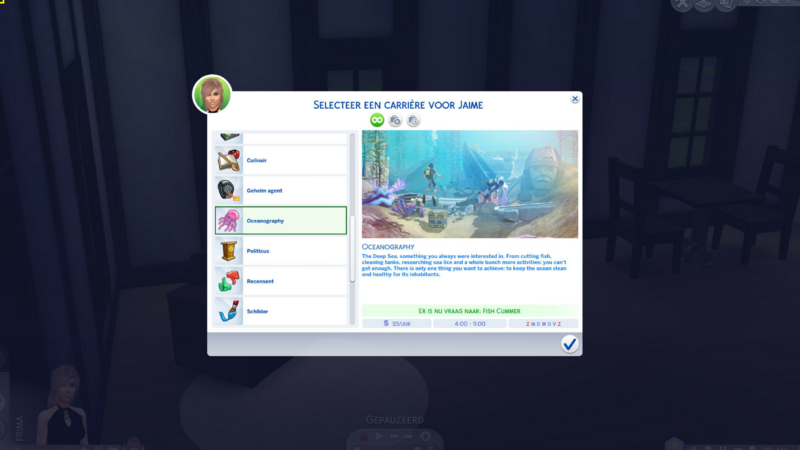 Assisting a real live Medical Researcher with a Bona Fide degree from Newcrest underwater telenovela department. And what a drama those sea lice are! Where the food chain meets the road they say, and how! Stay the course, get out of the lab every once in a while and get some exercise, and you'll be on your way. You're not just a diver anymore, and you're through with the constant itchy scalp. You are a master of diving and divers alike. Explore the deep for long lost relics, or shave some Simoleons off your monthly oyster bill. Remember to keep your own life clean and orderly as you still have to live in the real and dry world sometimes. But never forget, the world is your oyster. Oysters are your oysters! What could be more fun than blowing stuff up? Blowing stuff under water is what. You did the diving for ancient treasures, now it's time to set the charges and literally blow them out of the water. Marine Biology. No longer just a fish squeezer or a hired hand spending all your free time trying to get the water out of your ears. Now you're in the big leagues, studying all types of strange, exotic, bioluminescent, poisonous-barbed, ink-secreting, spear spitting sea life...maybe you should invest in some goggles. Whales are really really big, but the oceans are even bigger, and that's where you come in. Your stint as a marine biologist left you longing for the smell of salt in your nose and the spray of sea in your face. So get out your galoshes and your GPS, and hit the high seas. Your experience with diving, demolition, marine life cycles, and migratory whale patterns, have put you in the perfect position to now reap the seas of all her plentiful bounties. Who cares about over-fishing, or dolphin safe tuna, you know where the fish are and you're going to get them. Moving up in the world tends to mean being less hands-on, and more managerial. As a protector of whales you now spend most of your time behind a desk on the phone lobbying the bureaucrats in SimCity to pass more stringent whale rights legislation. It's not exactly working for the man, but it's working in really close proximity to him.